Author of Where Lives Lead, Restoring Patterns, Arrive by Dusk, Damp Whisper, Glenely Bay and Nostalgia from Paris, Blue Streams to Paradise and A Matter of Keeping. Newly Published by Archway Publishing. Mindy and Blaine enjoy a life of marital bliss in upstate New York. The fire is still lit on their marriage as they still experience romantic dates in the Hamptons, however, Mindy realizes that she wants more and that is to start a family. She manages to chase this desire regardless, while planning a gala with her favorite charity and opening a new design school in New York. Blaine has many projects on the horizon including the acquisition of a new hotel out west and the family business, but the most important will enable a new cast to arrive in Crystal Shores. He is expanding to the film and entertainment market in addition to his hospitality empire. A venture which requires the expertise of his mother, Harriett, and an avant garde writer, Genevieve, who grasps the essence of the Shores and results in a promising project. Mindy decides to support his dreams with conditions. Will Blaine find the time to help Mindy realize her dreams now that he is more successful? Or will a move to the west coast delay their plans? Wherever their lives may lead all directions still point to the serenity of his first development and Crystal Shores. A contemporary tale of love and sacrifice as different paths attempt to unite. It has been ten years since Mindy Croixe has left the shores of her beloved village. Doors have opened for her in New York where she is known as a highly acclaimed artist and in France. The same has occurred for her counterpart Blaine whose career has propelled to new universal dimensions through his conglomerate. However, the two meet on one fateful night in the south of France, the country where Mindy, now widowed, had set up her new life. Their journey continues across continents. 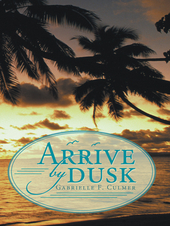 Arrive by Dusk is full of symbolic, cultural and professional appreciation as the saga of the two families continues and the reconciliation of two people solves many issues. A modern, professional and romantic novel about a cutting edge and focused fashion designer and her financier boyfriend who live in NYC and are on the verge of new business ventures. In between their busy work life in the city, relaxing summers in Cape Cod and Monaco, and global work commitments, they are about to formalize their relationship and life seems optimistic. However, unexpected incidents regarding their businesses occur. Grateful for the support of each other, they must rebuild their endeavors. Please note that no personal information is saved, collected or shared by this website or page owner. Your privacy is our concern. You have the option and ability to opt out from any promotion at any time so that nothing is shared without your consent, and also, to not use or to take care with any links which may inadvertently extract information against your knowledge or permission. As usual, please take care when using third party websites and links over which this page has no control. Thanks for being a loyal reader and fan.